Bharti Airtel the leader in the Indian telecom space has brought in a unique offer for all the long distance calling customers. 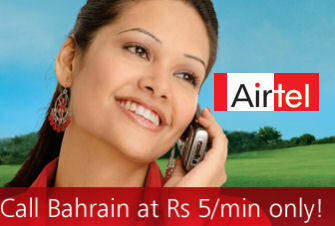 Now customers will have the privilege of keeping in touch with their loved ones in Bahrain with just Rs.5/min only. Airtel has reduced their calling rate to Bahrain from 25th of Sept ‘09 and is slated to follow till 23rd of Dec ’09. Prepaid customers will be able to enjoy the benefits without any special packs. This is a special offer for a limited time only. However this offer will not be applicable for PCO. The rate of Rs5/min for ISD calls to Bahrain is applicable only to prepaid customers (except PCO). This tariff is valid from 25th Sep 2009 to 23rd December 2009 .
nehi vai Indiaka mal lutke udhar vejneke liyeto jada bat korna parega us liye.Airtel no 1 lutera.Sabse jada rate hai uska.Vodafone is best of all.